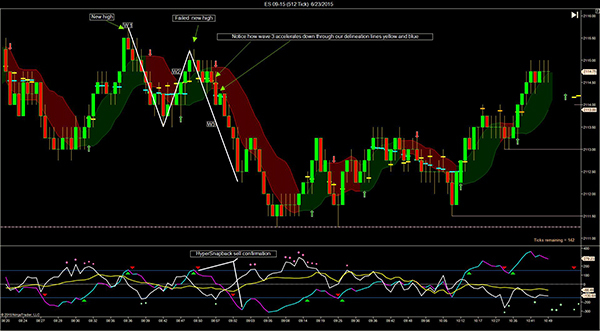 Price action, the actual movement of price, is first and foremost when trading. All technical indicators and studies should be used for confirming what price action is telling you. But, how do we read price action? By wave counting. Many people have turned simple wave counting into a complicated endeavor, with sub-waves, sections, etc., rendering the whole process an exercise in futility. Here at Stealth Traders, we like to keep things simple. Because the third wave is the strongest, we count only three waves. That’s it, and that’s all you need. The simplified method that we have designed at StealthTraders is to first start with a high or a low. These are shown by the Dynamic Targets indicator. Use the chart below to follow along. Click to enlarge it. A high will start a Wave 1 down. If price fails to reach the previous low, then that is a failed new low, which ends Wave 1 and starts Wave 2. If Wave 2 then fails to reach the start of Wave1, then it’s a failed new high, which is the end of Wave 2 and the start of Wave 3. As you can see, the Trend Line in the HyperSnapback indicator along the bottom confirms the Wave 3. You can also spot what some might label as Wave 4 and Wave 5. But, we like to keep it simple. So, if Wave 3 passes through the Delineation Lines, the blue and yellow lines on the price chart, also part of the Dynamic Targets indicator, then we relabel it a new Wave 1. So, Waves 4 and 5 are really just new Waves 2 and 3. You can go through any chart and see the wave patterns occur over and over again. 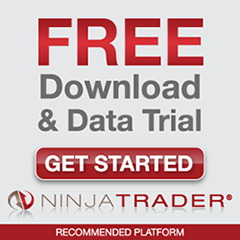 Become familiar with them and you could significantly improve your trading results.